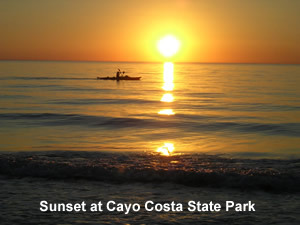 Cayo Costa State Park is one of the largest underdeveloped barrier islands in Florida. 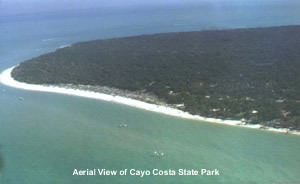 It is accessible only by private boat or ferry (about a 20 minutes ferry ride) but is worth the trip. 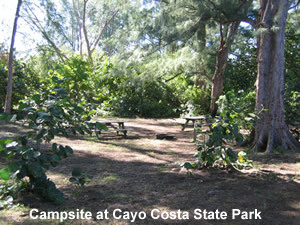 Although there is not any RV camping available at the park, there is tent camping as well as cabin and yurt rentals. Admission to the park is $1 (on the honor system) but that fee is waived if you are camping. There are 30 tent sites in the campground, reserveable through Reserve America with a maximum of 8 people allowed on each site. Each site has a picnic table and ground grill. Bathrooms and showers are located nearby (toilets are flush toilets but showers are cold water so be prepared). Check in time at the tent sites is 3 pm. Checkout is at 1 pm. The cost is $18 per night. The 12 cabins are also reserveable through Reserve America but they are popular so make reservations early. Up to 6 people are allowed per cabin with check in at 4 pm and checkout at 11 am. They are primitive with three plank bunk beds and a table. They don't have electricity or any other amenities, but the views and proximity to the beach make up for it. There are bathrooms and showers nearby (again, the showers are cold water), as well as grills for cooking. Cabins cost $27.52 per night. When planning an overnight trip, make sure to bring in your own food and beverages as there is no access to any on the island (unless you make friends with one of your camping neighbors). The park follows a carry-in, carry-out policy so all your garbage goes back out with you. But, the ranger on the island does sell ice. If you have a dog, it's welcome at the park, but not on the beaches or by the cabins so if you are overnight camping with your dog you will need to tent camp. If you are planning a trip to the island in the summer, be prepared for bugs and mosquitoes and bring a supply of insect repellent. 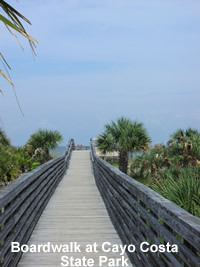 Some things to do and enjoy on the island: The beaches - There are about 9.5 miles of beaches on the Gulf of Mexico. 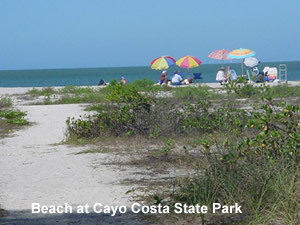 They are a great place for shelling (especially in the winter months), swimming, snorkeling, fishing (everyone over the age of 16 is required to have a state of Florida fishing license), hiking, and sunbathing. Biking and hiking - Bike rentals are available from the park ranger for a half day or full day. Nature trails (about 6 miles of them) on the island are a great place to do bird watching, especially in the spring and fall when birds are on their migratory journeys. Fishing - Click on this link to see if you need a fishing license, and if so, what kind. Your trip will get ruined in a hurry if you get fined for fishing without a license. If you go surf fishing from the island, you can catch flounder, snook, trout, redfish, snapper, whiting, sheepshead, and tarpon. Watch the Sea Turtles - nesting season is from May to September. Enjoy the ranger programs - On Wednesdays and Saturdays at 10 am the park ranger has varying programs about the island and its inhabitants at the park's amphitheater . On Thursdays or Fridays from October to April the ranger has an evening campfire program. Call 941.964.0375 for specific information or stop at the ranger station on the way into the park for program titles and times. Ferry service to the island/park is provided by Tropic Star of Pine Island and departs from Pineland, Florida. Reservations are required on the ferry and there is a fee. Call Tropic Star at 239.283.0015 for specifics. For more information on the park, click here to visit their official website; or click here to download a park brochure. Click here to download a map of the park. Extra reference: FAIRING / FILLERS | Merritt Supply Wholesale Marine industry.